The Second Order, later known as the Poor Clares, had its beginnings in 1212. In that year St.Clare of Assisi asked St. Francis to be allowed to embrace the new manner of life he had instituted. She was soon joined by several other devout women, including her mother and sister. St. Clare was the first woman to write a rule (a way of life) for her community that, following years of struggle, received papal approval in 1253. This order includes many different monasteries of cloistered nuns professing the Rule of St. Clare. 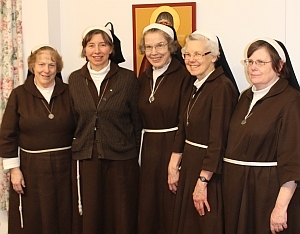 The Poor Clares number over 20,000 sisters throughout the world in 16 federations and in over 70 countries. There are several Poor Clare monasteries, representing different traditions, within the geographical boundaries of the Province of St. Barbara.